The stream flows into the river, the river flows into the sea and together they all flow right into the ocean. Everything begins with an Idea. Any candid concept or concrete substance was built out of an idea. Everything embodies an initial idea, everything originated from the building blocks of ideas. If you have an idea, you're beginning a journey, because this is the very step from which all great journey begin. You must branch out with an idea. It is the foundation of every great enterprise the life of every invention. The Universe is God's great idea. 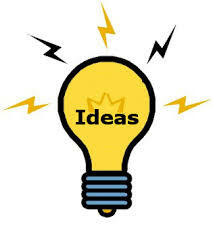 It will always begin with an idea.